This sounds like one of those knitting sweaters for penguins things, but apparently it’s actually true that a wildlife refuge in San Rafael is looking for people to knit bird’s nests for the abandoned baby birds they care for. 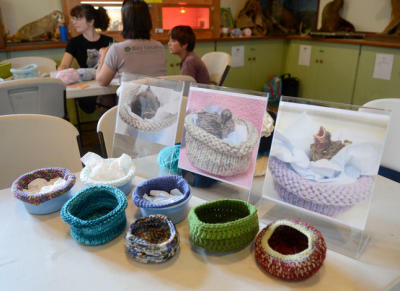 WildCare says it would like to collect about 1,200 of the nests, which are basically just knit bowls. They’re placed into plastic bowls then lined with tissue to help keep the birds warm and cozy. The refuge says about half of the animals they rescue each year are birds. They have patterns for felted and unfelted bowls of various sizes and ask that nests that are unfelted be knit very tightly so the birds won’t get caught in them and be made of machine washable materials because baby birds eat and poop a lot. What a fun project this would be fun a scout troop or a science club! Or just make some yourself and pass them along. You might even look locally and see if there’s a close to home refuge that could use the nests as well. Does anyone know if I could crochet a nest instead of knit?